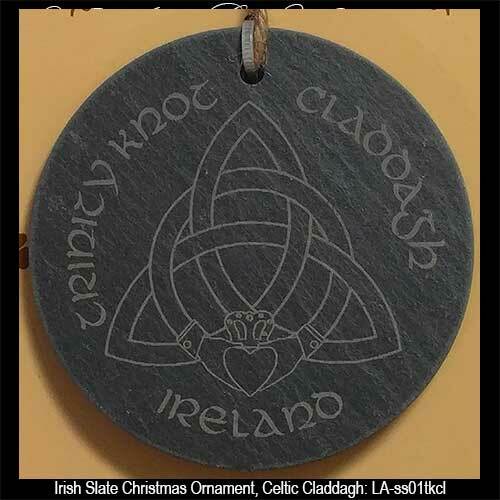 Irish Christmas ornament features an interlaced Trinity knot and Claddagh etched on a slate disk. The words Trinity Knot and Claddagh along with Ireland are etched on this Celtic Christmas ornament. This Irish Christmas ornament features a laser etched Claddagh that is interlaced with a Celtic Trinity knot. The Trinity knot and Claddagh ornament is crafted upon a 3" diameter disk of Irish slate that is ready to hang on your tree with the included brown twine. 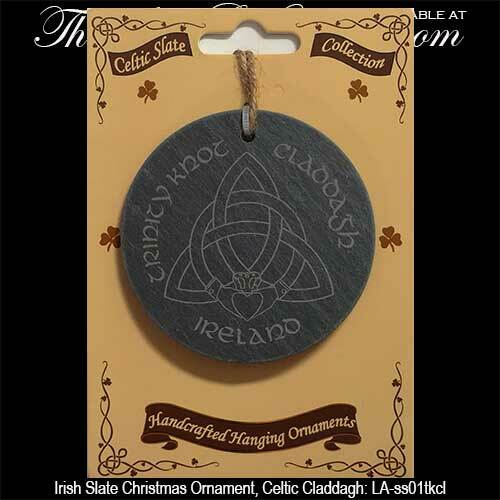 The slate Irish ornament is made in Ireland by Liffey Artefacts and is received with Claddagh and Celtic knot history cards, complements of The Irish Gift House.